Nobody will argue that Bootstrap’s popularity is absolutely deserved. Lots of people have already built Bootstrap based websites enjoying the ease of its use. Many words are written about Bootstrap, its nature and main features. Some articles impress with the number of words, other with the multitude useful explanations or recommendations. 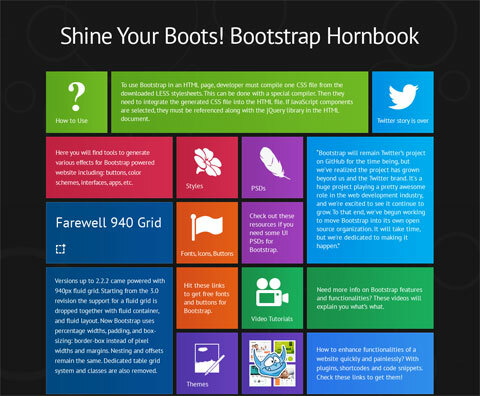 No doubt, all they are of a great use for those who want to learn more about Bootstrap. But we want to simplify your task proposing a nice and absorbing solution. You are welcome to discover an interactive infographic created by TemplateMonster team. It has gathered all necessary information and will share it with you. Below you can see a static version of the infographic, but you need just to click this screenshot and you will discover the interactive one which will involve you with its animation.. 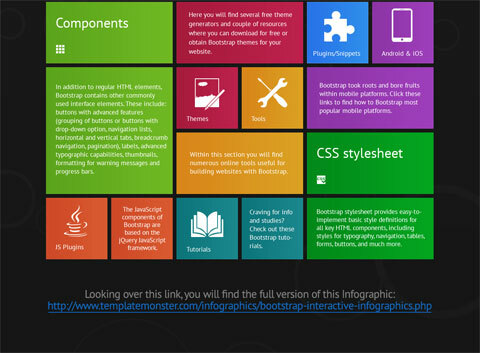 The infographic has a look of Windows 8 Metro interface. This OS version is pretty popular and thus such look makes the infographic even more intuitive. Content blocks of the guide are subdivided into categories and are ranged by the color to simplify your perception. There are also other guides by TemplateMonster which you can see visiting the Infographics page. Just click the screenshot below and learn more about Bootstrap – so easy it is!